The Diamond Condominiums on Yonge is a new condo development By Diamante Development Corporation currently in preconstruction at 75 Canterbury Pl, Toronto. The development is scheduled for completion in 2017. available units start from $268,000. The development has a total of 386 units. Available size from 439 Sqft to 839 Sqft . 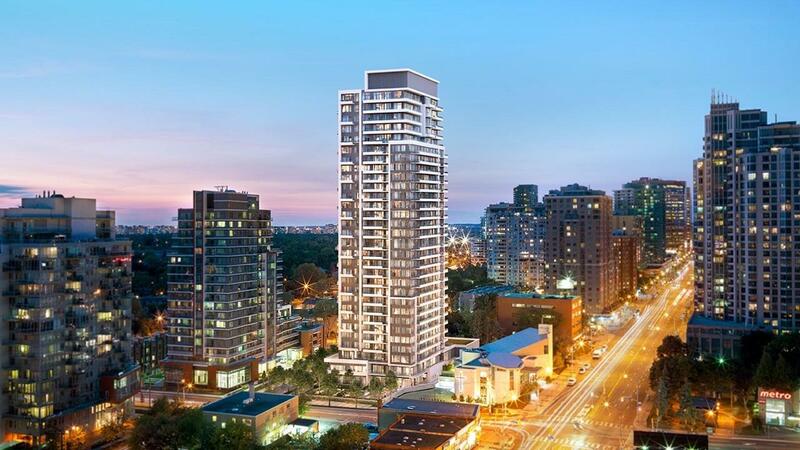 The Diamond Condos on Yonge is located in "the heart of North York's City Centre" and will soar 30 storeys (92 metres) in height with a total of 386 dwelling units which was increased from the previous proposal for 283 units, 26 storeys and 77 metres in height. The design will be "an elegant vertical expression of white metal and glass, accented with field stone walls at the base to complement the spectacular private park like gardens". The residential building entrance is located on Canterbury Place and total residential gross floor area for this development is 24,247.5 square metres. Of the 386 residential suites, 236 will be one-bedroom units and 150 will be two-bedroom units. Unit size range from 439 square feet to 839 square feet. There are 390 proposed vehicular parking spaces located in 6 levels of underground parking. Amenities offered at The Diamond Condominiums include concierge, exercise room, yoga area, spa, party room with kitchen, patio, BBQ area and theatre room. This building will be "tall and impressive" offering views of the City with a landscaped private garden marking the "North York urban skyline with presence, character and Diamante quality". From 439 sq. ft. To 839 sq. ft.